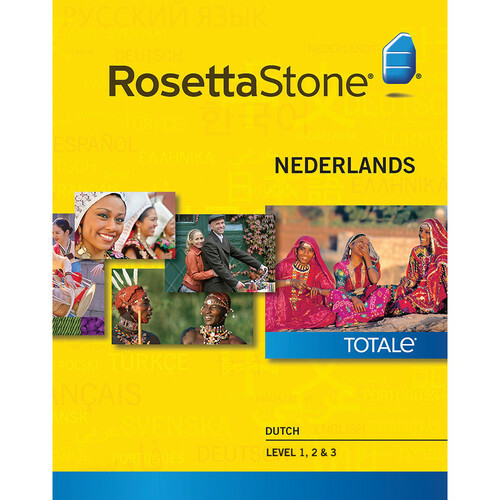 The Rosetta Stone Dutch Levels 1-3 (Version 4 / Windows / Download) uses visuals and sounds to train you to speak and think, as well as read and write in Dutch. Instead of teaching you to memorize and repeat, it leads you to recognize patterns, speak intuitively, and be confident in your pronunciations. From the first lesson, you'll hear and use only Dutch. Your native language won't play a part at all, and you'll be engaged actively. The teaching sequence places a higher focus on speech and thought, but it also effectively balances reading and writing. Levels 1-3 feature 150 hours of instructional content, 50 hours in each level, that will teach you the skills to enjoy social interactions, like travel, shopping, and sharing your ideas and opinions. Level 1 teaches basic conversational skills, such as greetings, introductions, and simple questions and answers. Level 2 focuses on getting around, making and receiving phone calls, and making reservations. Level 3 presents scenarios in health and well-being, celebratory events, and making measurements. You'll learn to ask for a band-aid, interact at birthday parties, purchase the right proportions at a deli, and the like. You'll start speaking in the very first lesson. In each one you'll be introduced to situations where you'll learn to understand the relevant language skills. Included with your purchase is a 3-month free trial of Rosetta Stone's TOTALe mobile app service, which you can use to progress through the 150 hours of lessons on a phone or tablet. As you find most convenient for you, you can switch between your home computer and TOTALe in completing the lessons. TOTALe additionally offers interactive learning games and live online sessions with other learners on your level. Your purchase provides you with an instant download and activation of Levels 1, 2, and 3, and TOTALe. Levels 1-3 can be installed on up to two computers, not limited to one location, for up to five usernames, and the TOTALe trial is for one user. Users must be at least 13 years of age to use this package. From lesson one, Dutch is the only language you'll hear and use. Your native language will not be there to help, because without it you'll learn actively, which will make you more successful. You'll be introduced to new words and concepts in a sequence carefully designed to accelerate your learning process. You'll be taught sights, sounds, words, sentences, and conversations. As you progress, you'll use what you've learned to understand new vocabulary. The secret to success with Rosetta Stone is that instead of memorizing rules, you're led to discovering patterns, and to arriving at the right answer intuitively. And at just the right intervals, you'll learn new material and revisit some you've already covered. All this will help you retain what you learn and begin thinking in your new language. Instant feedback and guidance features, such as speech recognition technology, keep you on track the entire course. Visual and audio feedback reinforces correct answers and calls attention to incorrect ones. Every time you speak, speech recognition technology identifies what you're saying, evaluates your pronunciation, and gives you a real-time assessment. This results in teaching you to speak confidently. The technology identifies the words you're pronouncing while you're speaking them, verifies whether or not the words or phrases are correct, and then it compares your pronunciation to a native speaker model to see how you did. Your voice is compared to 100 native speaker samples per second to give you the most accurate feedback possible. The goal is to give you the confidence that you're using the right words and phrases at the right time and pronouncing them correctly. If you're aiming at perfection, for each speech experience you can view your speech waveform, pitch contour, and spectrogram side by side with a native speaker's, and you can take a look at how your pronunciation has improved with each try.